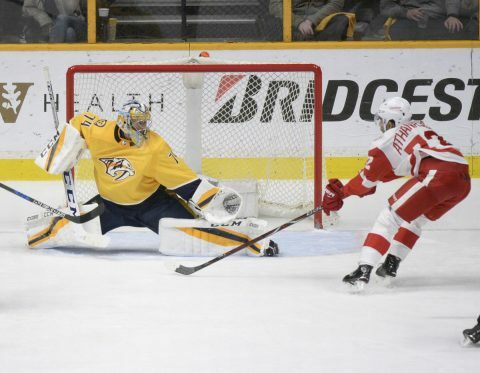 Nashville, TN – The Nashville Predators dropped their second game in a row with a flat performance against the visiting Detroit Red Wings, 3-1 in Nashville. Detroit goaltender Petr Mrazek was solid in net for the Red Wings with 31 saves on the night, fighting off every offensive attack from the Predators. Luke Witkowski scored his first NHL goal at 4:12 of the first period to give the Wings the early lead, 1-0. Witkowski broke free of the Predators’ defense and beat Nashville goalie, Juuse Saros on a back hand shot. Gustav Nyquist made it 2-0 at 10:54 of the period with his redirection of a Nick Jensen shot, and suddenly, Detroit had the momentum and the two goal lead. 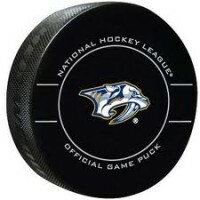 The Nashville power play had been flat for the past several games, but finally found the net when Craig Smith took off on a breakaway, netting the wrist shot to cut the lead in half, 2-1. Smith took an amazing stretch pass from P.K. Subban for the score. Detroit made it 3-1 on an “empty netter” at 18:41 of the third period, when Darren Helm scored for the final tally. Nashville has lost consecutive games for the first time since December, when they lost to Winnipeg and Carolina. Detroit goalie Petr Mrazek is 6-0-0 against the Nashville Predators in his career. Predators host Ottawa on Monday night at Bridgestone Arena. Puck drop is 7:00pm.